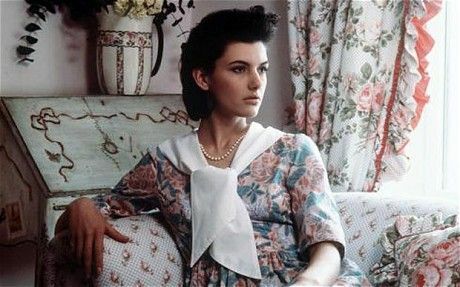 When I was a kid, Laura Ashley was a thing and so my parents decorated my room in carpet-to-ceiling florals — I was basically living in the contents of a 19th century sewing basket. Now that I’m a “grown-up” (ugh) floral decor is still a part of my life, but in a much subtler way. But the truth is, it can be tricky to figure out the balance between floral chic and calico insanity, so we reached out to photographer Arielle Vey. Here, she gives us some tips on how to confidently decorate with flowers (without looking like you’re 12). Show off your aesthetic know-how by expertly mixing various mediums in the same space. Choosing all floral illustrations, photos, or paintings might seem like a cohesive choice, but can dampen the mature composition of a wall. Play with photos next to graphics, illustrations next to living things — the more you experiment the more confident your combos will be. There’s a reason people eagerly ask “what are you colors?” in reaction to every wedding, party, or home you are decorating. Picking a cohesive and design-savvy color scheme makes it almost impossible for a room to look childish. A solid selection of two or three colors will help guide your hand in all decor choices, floral accessories included. Look through magazines, Pinterest, or play with paint swatches to find the perfect combo for your personal vibe. To avoid having too much of a good thing, pair bold and busy floral patterns with a clean and simple graphic. The stark simplicity of a graphic design will give extra life to a flora-filled photo or illustration and easily reveals the harmony between nature and technology. There’s nothing more “grown-up” than a minimalist approach. If you’re able to part with your treasure trove of trinkets, a stark decor approach will always look smart. Sparse usage of a single flower print will show delicate restraint, with a hint of whimsy. Likewise, a large, solo floral piece of artwork shows aesthetic resolve and bold, yet subtle decision-making. An often unused approach to florals is going black and white. Somehow black and white have become the patron colors of adulthood, and though they might not be as fun as fuchsia, they’re guaranteed to make you look like a serious design star.